When it comes to baby gear, the options are endless and overwhelming. During the registry process for my first born, I was so overwhelmed that I actually cried in the baby aisle of Target. I just couldn't even begin to grasp what we might need when we didn't even know him yet! Thankfully, in the almost three years since I last gave birth, the registry process has changed for the better thanks to Gugu Guru. Gugu Guru is an online registry that matches a mama with products that will fit her needs and her lifestyle based on a simple style quiz. Along with recommending tried and true baby must haves, Gugu Guru will introduce you to the newest brands and "it" items on the market by creating a custom baby registry just for you. Whether you consider yourself a minimalist mom, boho mama or classic mommy, Gugu Guru will have the answer for all of your needs. As a bonus, your Gugu Guru registry is also universal so you can add a product from anywhere on the internet to your baby wish list before sending it out to into the world. When sitting down to consider what I really need for our sweet baby number two, one thing kept popping into my mind: "work smarter, not harder". After figuring things out on the fly with my eldest, I am ready and prepared to only purchase/pull out of storage products that I know will benefit our family as we attempt to navigate a newborn and a toddler. So long wipe warmer, hello zip up swaddles! Luckily, many monitor companies have gotten wise and now provide the option to add a second camera to your existing system but, of course, my chosen monitor does not. After some research, I'm into this V Tech Safe and Sound model for a few reasons: the wide angle lens option is perfect for monitoring my toddler's room (I am less concerned about his sleep habits and more about his ability to wreck his room like a rock star during nap time), the ability to add up to 4 cameras (to cover the playroom, too!) and the large color split screen. For my second born, the monitor keeps an eye on room temp, pans side to side and has a movement sensor. While this "bassinest" will be amazing for all mamas, as a C Section mom, this little baby is calling my name. Twisting and leaning down to lift a babe from a low bassinet next to your bed can wreak havoc on a healing abdomen for weeks (or months) after delivery so having a bassinet that is height adjustable and swivels towards you is priceless. As a bonus, one side can be set to be flexible so you can push it down in order to easily lift baby out. I mean, I don't know what kind of magic the DockATot people are weaving but the DockATot is, without a doubt, the number one product my friends with new babies are recommending. It's perfect for transitioning baby from bassinet to crib, and even more important for a second child, to sleep anywhere the DockATot lands. I've already sung the praises of the Owlet and I can't wait to put it to use when our new baby comes home from the hospital. I would wake up in cold sweats when my son was a newborn, sure he had stopped breathing, and I cannot imagine the relief of being able to spot that green light, letting me know she is safe and sound. I don't know what has happened to swaddle technology in the last two years but I am so into it. With my first, we would watch YouTube how to videos on swaddling at 3am and with our second, we will be wrapping snugly with Velcro closures and working with a bottom opening for diaper changes- if that's not the definition of "work smarter, not harder" I don't know what is. In typical first child ridiculousness, my son was "given" my iPad as a white noise machine. Yep, that happened. Poor second baby is not going to be so lucky, but I found an amazing option for her that is portable, has great volume control (we'll need it loooooud to drown out big brother) and comes with an app to add sounds and recorded messages. I'm also going to snag the portable baby shusher, again because this little one is going to be expected to sleep through a little more chaos than her brother did. Without a doubt, I wish I would have considered how our family would grow when buying our first stroller. While there was no way my hormone fueled, first time pregnant mom brain could have even considered planning for a stroller that would grow with my family, I recommend that all of my friends consider purchasing a stroller that can accommodate one, two or even three babes. Enter the UPPAbaby VISTA travel system. With the ability to rock out as a single stroller that allows for infant strolling with the MESA car seat or bassinet and single child strolling with the Toddler seat, the VISTA transitions easily to a second child with ease. Literally the number of configurations for a two child family is unreal - take a peek at the options here. Because our eldest child is just two and a half, he will still ride constantly in the RumbleSeat while our newborn rides in her MESA car seat attachment. When our first born has a little more endurance, we'll snap on the PiggyBack Ride Along Board for him and our daughter will continue to grow into the VISTA with her own Toddler Seat. I definitely don't have much faith in a toddler's desire to hoof it around town so we'll be sure to keep the VISTA locked and loaded with two seats and the PiggyBack riding board, all of which is possible with the VISTA. While we don't plan to have a third baby, if we did consider adding another babe to our circus, the VISTA would transition right along with us - and finding the perfect stroller would be something that was already checked off of my to-do list! Be sure to check out the amazing textiles available on the VISTA, including leather accents that will wear oh so well with time (and also, hello, can be wiped clean!). If you're in a rough weather climate like we were with our first babe, the VISTA can be outfitted with a ton of amazing accessories from a rain shield to a footmuff - and yes, a caddy for mom's gigantic and extremely necessary coffee. Here's what I know about car seats now that I'm a second time mom: I need one that is incredibly safe (like top of the line safe), easy to install (like, I can do it myself without watching Youtube tutorials) and it works with my stroller to become a travel system. Without a doubt, the UPPAbaby MESA fits the bill. First of all, the MESA in Henry is not only a gorgeous shade of grey but it also a naturally fire resistant material - without the use of additional chemicals. The MESA was also awarded the NHTSA 5 star rating which is the highest government rating for ease of use. With the Smart Secure System, you can know with absolute certainty that the MESA is installed correctly thanks to an indicator window that changes from red to green when the seat is properly installed. I mean, with a newborn and a toddler breathing down my neck, I'm going to need all of the confirmations possible that I am crushing the mom thing, so bring on the indicator windows! As a bonus the MESA infant car seat is easily adapted to the UPPAbaby VISTA stroller to make a click and go travel system out of your stroller! With a potty training toddler, the back of my car is already stocked for all types of potty emergencies (like, we actually have a potty in the trunk) so I'm stepping up my game with this Ubbi diaper caddy. It has room to store an entire pack of wipes, disposable changing pad, diapers and a stash of big boy undies for a certain toddler I know. Oh, holy mother, where was this formula whipper-upper when I had a newborn the first time!? The Baby Brezza can make formula in any size bottle, warms to the perfect temp (98 degrees), stores an entire can powdered formula in the airtight compartment and mixes the formula without bubbles. Sign me up! Especially great if you're washing and prepping bottles for daycare the next day, the One Step Sterilizer sterilizes up to 6 bottles in 8 minutes and dries in 30 and doesn't require running an entire load in the dishwasher. Comotomo bottles didn't exist when I had my son but this time around, they'll be our top choice thanks to the squeezable body and lack of multiple parts to clean/lose. When I had my first baby, we ordered just one Mixie bottle when he was a few months old....after trying it one time, my husband told me that we needed to order enough to cover every single night feed so we could line them up, ready to roll for 3am. You better believe that what's we're doing this time! With a cult following, the Mamaroo is now on my list of must have's for baby - but sadly, it wasn't widely available when I had my first. Rocking, soothing, swinging, it does it all and keeps baby content while mama tries to make dinner or bribe a toddler to eat his veggies. With my first child I hardly wore him as an infant but I know my second will be worn constantly, from the start (mostly thank to the aforementioned first child). The Solly Baby Wrap Carrier is made of soft, stretchy fabric perfect to keep a sweet newborn baby snuggled up and safely out of your arms. You can use the Solly for babes up to 25lbs and after that, I highly recommend the Ergo 360 - the back support is a must when wearing bigger babes! I love a cute diaper bag but let's be real, if you have more than one child, you need your hands free and ready to snag a runaway toddler or to fish out a paci for baby. A diaper bag with a cross body strap AND a backpack option is the only way to go. If you aren't into leather, this is a great option and a mini version is available for your little mama! With my first baby, I would stop everything to take him upstairs to his nursery to change him or lay him down for a quick second. I'm afraid baby #2 will have to get used to diaper changes on the fly so I plan to stash a pack 'n play with a changing dock and infant bassinet in our living room so that I have a place to change/park her when big brother needs my attention. This post was written in partnership with Gugu Guru and UPPAbaby- all product suggestions, opinions, thoughts and ridiculous examples of parenthood are my own. 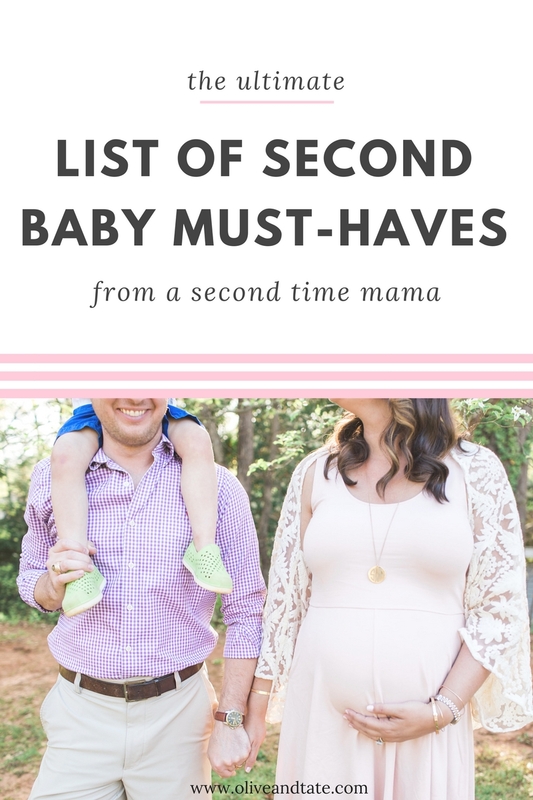 What are your must have products for a second baby? Hook a mama up and comment below! I currently own the Vista and mesa from when my almost 2 year old was born. I was hoping to convert it into a double stroller when #2 arrives in Sept. However my almost 35 lb eldest is too big for the toddler seat. I am still trying to figure out what our double stroller option is bc I just love using the mesa as a travel system with the Vista. You will love yours!!! My oldest is going to grow out of it soon thanks to his long legs....but I'm hoping he'll transition well to the ride along board with the seat as a back up! I'm so glad you've loved the system - I can't wait to put it to use when baby finally makes her debut! We got the Halo bassinet and she hates laying flat on her back so we haven't used it at all. She still sleeps in the rock n' play... go figure. We are working on transitioning her into her crib this week though! You will LOVE your Mesa and Vista, I'm obsessed with ours. I have heard such great things about the brezza but we we didn't want a diaper warmer or bottle warmer because "start out like you're gonna hold out" haha. Vivi gets room temp nursery water, easy peasy! I’m curious if you still feel these are a must have for a second a year later? I’m about to have our second and curious on your thoughts!